It was in February 2015 when King Mswati was reported to have undertook to personally see to the eradication of HIV in Swaziland by 2022. The question is how feasible and valid is such an undertaking with the poor current conditions of the government hospitals. To eradicate an epidemic like HIV requires a change of attitude, commitment to the change, proper use of financial resources and an infrastructure properly designed to cater for such. Talking of a change in attitude, recently the king married two more girls, upholding a culture that permits and promotes promiscuity. Faithfulness is said to be the key to the reduction of sexually transmitted infections. How does King Mswati hope to change the attitudes when he himself and his household still uphold a culture of multiple partners which puts women in a dire predicament, as they are considered minors and have no say in sexual matters of their spouses. Over and above this he controls and spends the country’s financial resources in a wasteful manner, not on needy citizens but on his household. According to a report issued by IMF on Swaziland, spending on the royal family drains the economy of Swaziland. This is evidenced by the recent millions of Emalangeni allocated for the king’s wives spending spree. Not even considering the fact that the country has been hit by drought in the 2015 farming season. A report in the Swazi Observer stated that Member of Parliament Mr James Simelane of Esandleni constituency pointed out that families in his constituency have begun dying of hunger as a result of government’s failure to distribute food to the needy and poor families. Is this the king’s eradication tool. To let helpless citizens die of hunger whilst he wastes financial resources on luxury. How does it work? King Mswati III of Swaziland is at it again; he called another pointless national convention (bluffingly calling it The People’s Parliament) to pull wool over the Swazi nation’s face. He apparently last did this back in 2012, and now he has done the same to try and fool the world into believing there is dialogue between him with his cohorts and the people. The Sibaya Convention was called on Wednesday the 3rd August 2016 whereby the nation was summoned to Lobamba Royal Kraal to “deliberate” national concerns; it has gone for days now, even up to Saturday the 6th August 2016. The so called deliberations are just sugar-coating of a very bitter pill, that of not allowing the nation to critique the very form of government Mswati uses to rule the kingdom. As long as normal citizens voice out their concerns that don’t touch or question the king’s actions, don’t advocate for the legalization of political parties and human rights groups, they are “free” to say whatever they want. Here’s the biggest of all jokes this convention is about: the 2012 convention produced absolutely NOTHING, people were just venting themselves but neither Mswati nor the government did anything to address any of the submissions. I see this as another fruitless exercise, Mswati is only doing this because of the up-coming SADC (Southern Africa Development Community) conference of which Swaziland will be taking the chairmanship of for a while. Some of Mswati’s remarks have been to urge the nation not to picket, not to hold protests and demonstrations during the SADC conference. He’s essentially trying to save face in the presence of his counterparts of which some of them like Mugabe of Zimbabwe is another oppressor just like Mswati. He wants to tell his counterparts that there is democracy in Swaziland and we deliberate issue of national concern… and yet nothing could be further from the truth. It is all about propaganda and he’s successful to some level because I spoke to some friends in Swaziland and are no wiser of what is going on, they think its an opportunity, but they forget we have been here and nothing comes out of these deliberations. I believe the security forces will be fully deployed to crash any discontent within the kingdom especially during the conference, so it is up to us who are in the diaspora to sound the alarm and expose Mswati tricks to the world. 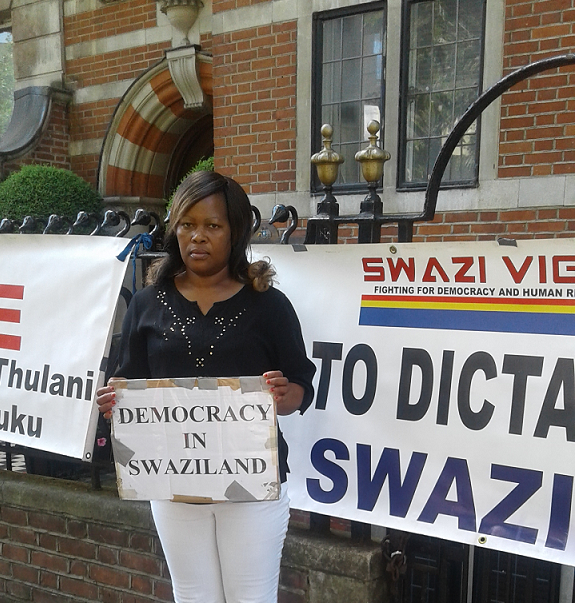 Viva Swazi Vigil Viva… we will not stop until Swaziland is free from the power clutches of Mswati. Swaziland has failed in the promise it gave a United Nations review in 2011 to change laws in the kingdom relating to freedom of association and assembly so they met international standards. 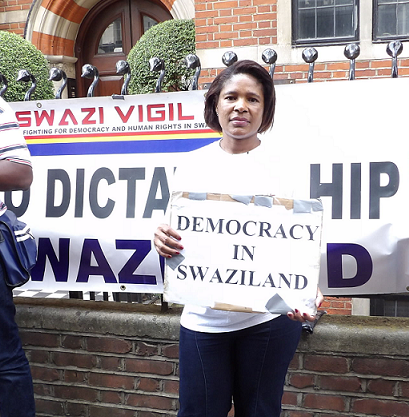 May 2016, Human Rights Watch stated, ‘The [Swazi] government has yet to repeal, or amend as appropriate, a number of repressive laws that restrict basic rights guaranteed in Swaziland’s 2005 constitution, including freedom of association and assembly. On the contrary the government has intensified restrictions on these rights over the past four years. The laws in need of amendment include the 2008 Suppression of Terrorism Act (STA), the 1938 Sedition and Subversive Activities Act, and the 1963 Public Order Act. ‘Police have sweeping powers under the Public Order Act. The king’s 1973 decree banning political parties remains in force despite repeated calls from local political activists to have it revoked. The constitution does not address the formation or role of political parties. 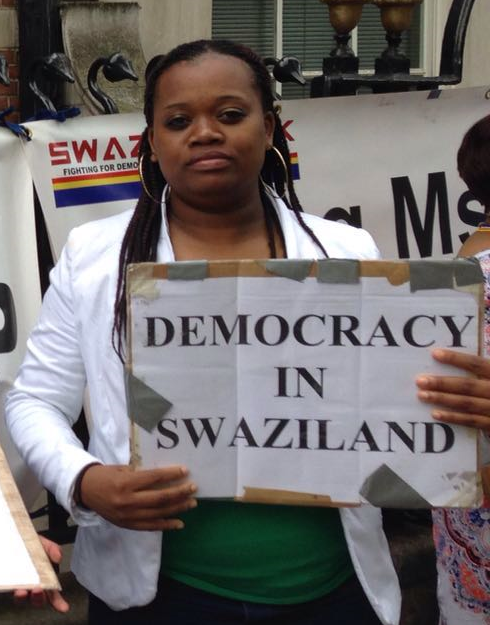 Section 79 of the constitution provides that Swaziland practises an electoral system based on individual merit and excludes the participation of political parties in elections. ‘Traditional leaders and chiefs have powers to restrict access to their territories, and have often used these powers to bar civil society groups and political groups like the Ngwane National Liberation Congress (NNLC) and the People’s United Democratic Movement (PUDEMO) from having meetings, recruiting, or any kind of presence in their areas. In 2011 PUDEMO challenged in court the government’s refusal to register political parties but the court said PUDEMO has no legal standing to approach the court as it did not exist as a legal entity.